The work of the Capitol Building's Insulation Division is as "behind the scenes" as you can get. 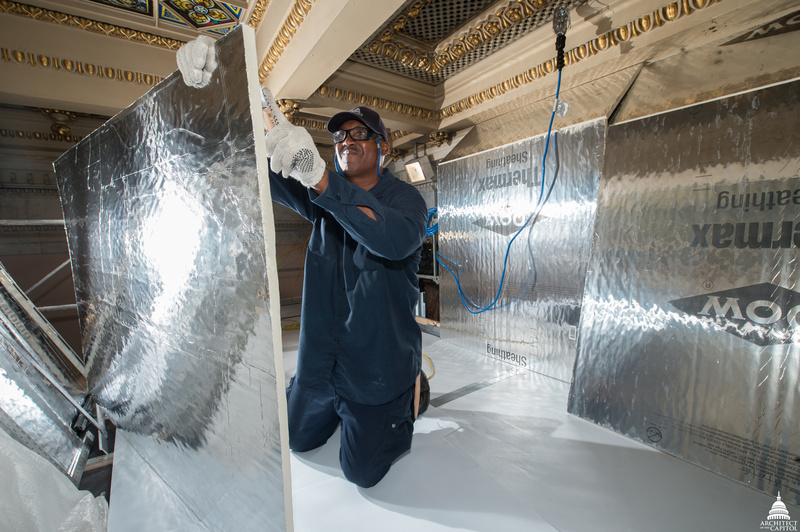 In addition to installing insulation, the shop also supports other divisions in its jurisdiction by performing dust control and hazardous materials abatement work in the Capitol Building and Capitol Visitor Center. 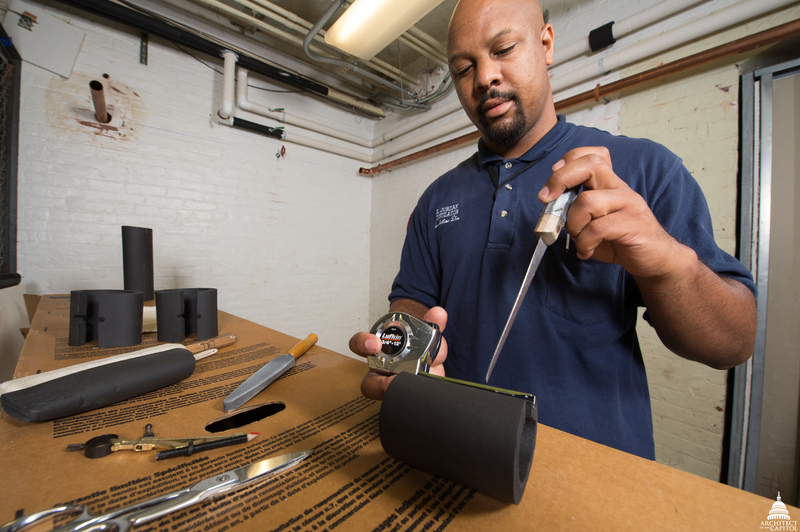 The insulators often work behind closed doors and within containments they build to ensure the safety of those who visit and work on the Capitol campus. AOC's Erin Jordan, part of the Capitol Building's Insulation Division. The shop's role has expanded in recent years, far beyond the installation of insulation as Deputy Capitol Building Superintendent Kristy Long explained, "We consider each employee in the Insulation Shop to be a jack of all trades. The shop's name is a bit misleading. They do so much more than insulation and are often the first ones on-site when we start a new project." The shop is frequently called on to survey new project sites. Employees conduct tests for hazardous materials, perform abatement work when necessary and give the all clear for projects to officially start. In order to properly abate hazardous materials, insulators suit up in protective gear and follow safety protocols to the letter. They spend several days or even weeks building containments of all shapes and sizes to house and protect the historic art, furniture and flooring from the impacts of their work. Think of the most challenging odd-shaped item you’ve ever wrapped and multiple that task by a hundred. This is the modern-day nature of their work. Every day is different. Every new project is an opportunity to learn something about the historic spaces of the Capitol. "I love the historical aspect of our job. Working in different rooms allows us to learn more about their history. Each one has a unique story," said Insulator Sean Sprouse. AOC's Larry Thompson, part of the Capitol Building's Insulation Division. While working in one of the world's most iconic and historically significant buildings is educational, there are also distinct challenges. "We work closely with the curators in developing plans for protective covering. We're often working on and around items that are hundreds of years old. We have to know the correct materials and procedures to protect them. We make sure we get it right," explained Insulator Work Leader Mark Holland. Their favorite recent projects include working in the Old Senate Chamber and removing paint as part of the Capitol Dome and Rotunda restoration projects. "We were removing caulk on the Dome, working right under the Statue of Freedom. The view from the top is amazing. You can see the whole city, something very few people have the opportunity to see," said Insulator Larry Thompson. Although most are unaware of their daily contributions, the insulators' work impacts us all. Their commitment to getting the job done well and safely ensures the Capitol Building’s story will continue to unfold for future generations. All nine of the shop's insulators have immense pride for their roles in maintaining the historic building. And as their leader, Insulation Division Supervisor Ronnie Britt, is equally honored to serve with them, "I am proud to lead such a capable team. The work we do is important to the preservation of the Capitol, and I have tremendous trust in them to always get the job done." BEING A RETIRED PIPE FITTER IT IS GREAT TO SEE ANOTHER TRADE THAT FOLLOWS US IN CONSTRUCTION, AND REALLY MAKES US ALL PROUD.